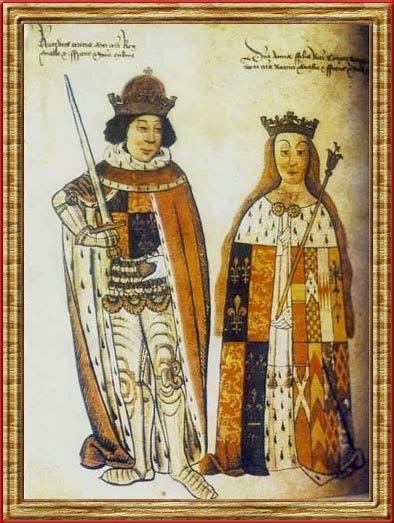 Isabelle and Anne Neville were the sole heirs of their wealthy and powerful father Richard Neville, the earl of Warwick, a man whose role in the so-called War of the Roses earned him the title of "the Kingmaker." Anne's role as a pawn during that tumultuous period illustrates the lives of so many women in the deadly political games that were always being played. Warwick was originally a supporter of King Henry VI of England, and with his enormous wealth and military success, Warwick fought on behalf of the Lancastrian king against the rebellious duke of York. But as Warwick's interests and allegiances shifted, so did the political marriages he ultimately arranged for his two daughters. By the time Anne was born in 1456, Warwick had switched sides, no longer supporting King Henry but fighting for the Yorkists at the battle of St. Albans. He ultimately helped to bring down King Henry and to secure the throne for the Yorkist claimant, who became Edward IV in 1461. 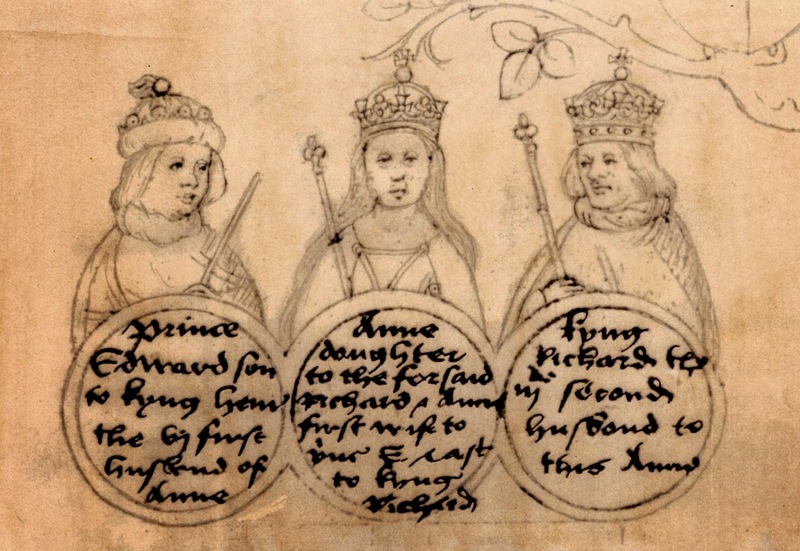 Having helped Edward to the throne, Warwick's goal was to marry his own two daughters to the new king's brothers, George, duke of Clarence, and Richard, duke of Gloucester. But Warwick's ambitions were thwarted, and he grew increasingly alienated from the king. Despite Edward's opposition, Isabelle and Clarence were secretly married in 1469--but by 1470, Warwick had once again changed political sides. Warwick switched his allegiance back to the Lancastrians--and his "new" ties were confirmed by his betrothal on 25 July 1470 of his younger daughter, Anne, to Edward of Lancaster, the son of Henry VI and Margaret of Anjou. The two were married in December, when Edward was seventeen and Anne fourteen. Within a year's time, however, Anne's father was dead, killed at the battle of Barnet, and her husband was defeated and killed at the battle of Tewkesbury. At fifteen, Anne was a widow, no longer princess of Wales. Although neither Edward IV, newly restored to his throne, nor Clarence, hoping to secure the entire Warwick inheritance for himself, wanted Anne to remarry, she was eventually to become the wife of the man her father had first selected for her, Richard, duke of Gloucester. The two were married in 1473, but the legal wrangling about her inheritance dragged on for some time. Anne gave birth to a son, named Edward, in 1476. The story of Richard, duke of Gloucester's usurpation of the throne in 1483, following the death of Edward IV, is well known. Less well known is Anne's story. Her only child, Edward, died in April of 1484. The emotional response of both the king and queen to this loss was widely reported; according to a contemporary chronicler, "you might have seen his [Edward's] father and mother in a state almost bordering on madness, by reason of their sudden grief." Anne died less than a year later, on 16 March 1485. Richard III would be defeated and killed at the battle of Bosworth a few months later, on 22 August 1485. There are several good online accounts of Anne Neville's life; I recommend the one posted by the Richard III Society. For many readers, Philippa Gregory's historical fiction has inspired an interest in the women of this period. But there are many excellent historical sources for those interested in moving beyond fiction. While accounts of Anne Neville, queen of England, are included in Lisa Hilton's Queens Consort: England's Medieval Queens, J. L. Laynesmith's The Last Medieval Queens, and Sarah Gristwood's Blood Sisters: The Women Behind the Wars of the Roses, there is one book-length biography of her, Michael Hicks's Anne Neville: Queen to Richard III--there is actually very little historical evidence about Anne's life, and this biography focuses heavily on the men of the period, but, still . . .
And while you're at it, you may be interested in reading about Anne's aunts, the six sisters of Richard Neville--David Baldwin's The Kingmaker's Sisters: Six Powerful Women in the Wars of the Roses expands the story of the Wars of the Roses beyond the battlefield and into the lives of the women affected by this period of civil war.